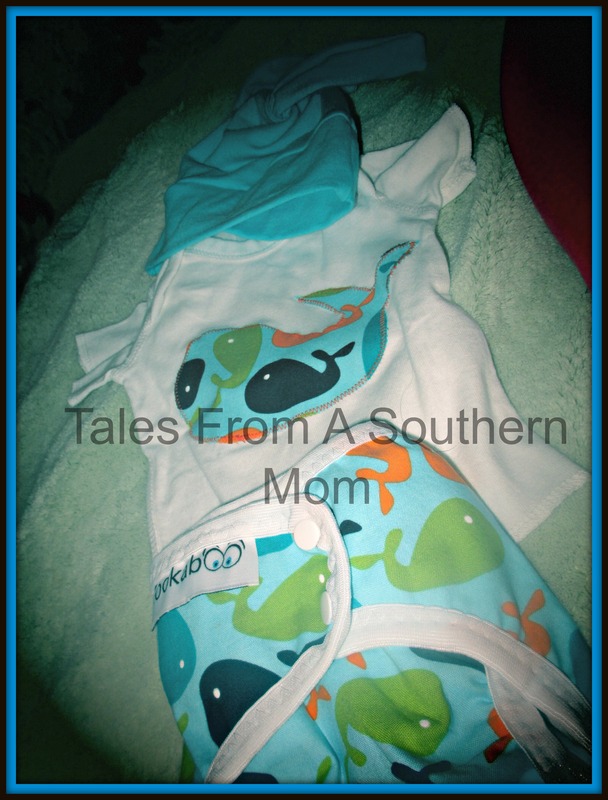 Zookaboo was kind enough to work with Tales From A Southern Mom and let us test out and review their diaper cover and t-shirt matching set. 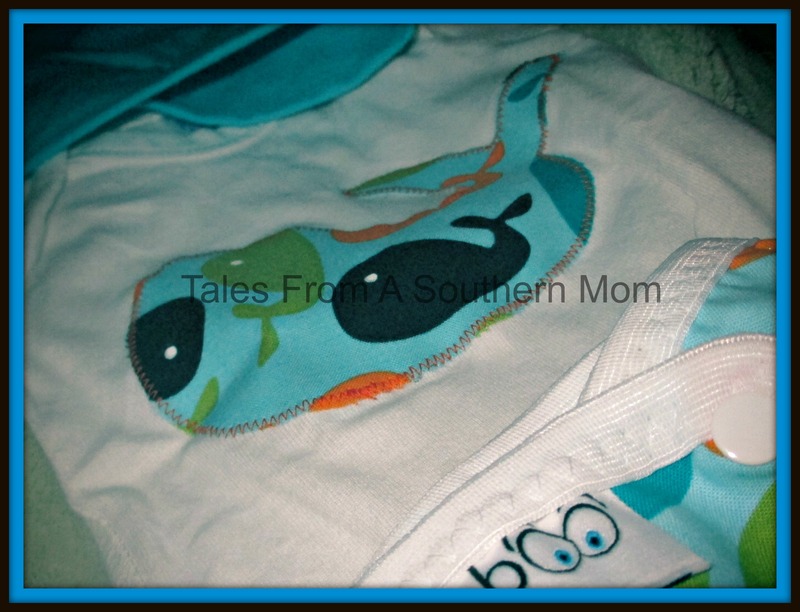 We received the Bringing Home Baby – Baby Beluga-White Tee and let me tell you this set is adorable. It is a t-shirt, a waterproof diaper cover and a knit hat to match. I was impressed with the high quality feel of the materials used in the set and the sewing was exceptional as well. There was not a string loose or a seam out of place; they do a very professional job. The beanie was soft and loose to not be uncomfortable for a new baby. It is made with baby rib knit to allow for enough stretch and you can do a single or two separate knots at the top to adjust for fit. The t-shirt has a very high quality feel and has a bright appliqué of a whale on the front. 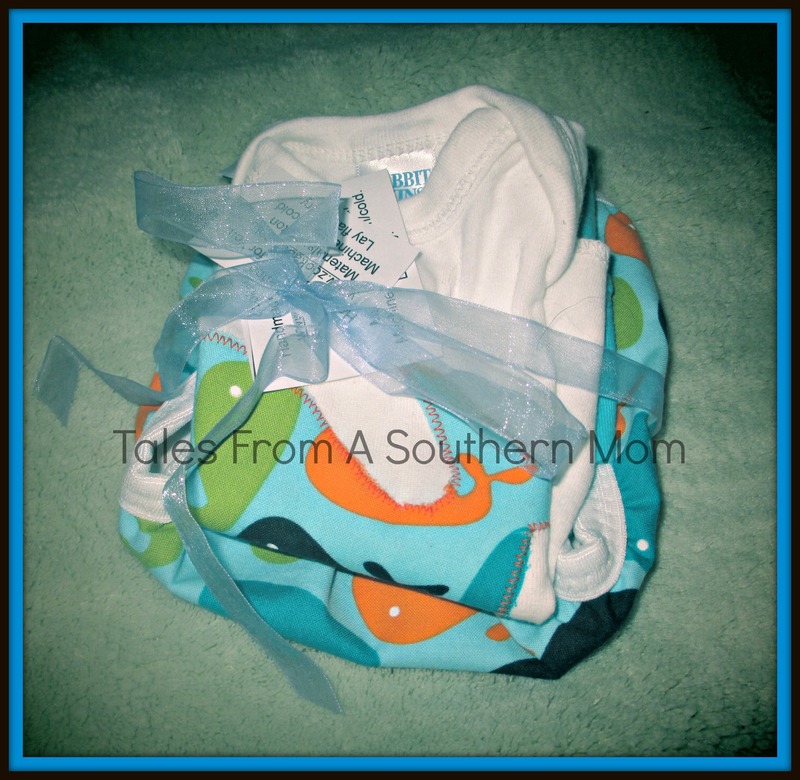 The diaper cover is for a newborn, is so tiny and adorable, and is made of the same bright fabric as was used for the shirt. It is made with cotton outer and is lined with waterproof PUL in white, which makes the colors really pop. This can be used over any diaper that requires a waterproof cover, such as a prefold or fitted, or could cover a disposable diaper too. The elastic over the thigh area is snug, but does not pinch. They have so many different prints and options for colors that go from boyish to girlish with a nice selection of gender neutral in between. The diaper covers are sized as follows: Extra Small: 13″ rise (7-11 lbs.) Small: 15″ rise (10-15lbs.) Medium: 17″ rise (15-25lbs.) Large: 19″ rise (25+lbs) OS: 13-19″ rise (10-35lbs.) This allows for a more custom fit than just using a one-size cover. I definitely will order more from this shop, I like the quality and the selection that they offer and the shipping is super fast as well. They have many other items, such as nursing covers, grow with me pants, reusable snack bags, games, crayon wallets, and a few other things. great selections either for you or as gifts. Next post: Putting it together…..
Oh, but prints are my preference! I have mostly solids but I live the prints I have! We have a healthy mix of prints and solids in our stash! Prints are my favorite, but I like solids if they’re a saturated, fun color. I would like to have prints but solids are ok too. I think the prints are cute. Prints. They are more fun. I love prints, but I am picky about which ones I like, so solids are always a good option. I have more colors than prints, but I love both. Solid colors are easier to match, so I usually choose them. Can I say that I like both? I guess if I have to choose, I’d pick solids. I love prints. I find solids kind of boring. prints! especially ones that are not too babyish. I like both prints and solids, but the prints are so cute! I was a little confused there Michelle! Makes total sense now! I prefer prints most of the time… Most baby prints are really cliche and tacky. I like edgy prints like rock a bums put out or nerd printed–Mario, Dr who, star wars… I really want some Tim Burton inspired prints! I like solid colors and prints. Really it just depends what mood I’m in that day or what we are trying to coordinate with. I love prints. My initial reason for cloth diapering was the cute factor (and cost of course)! I’m always drawn to prints. I think we own one, maybe two, solid colored diapers. Both! Prints and colors each have their place. I tend to gravitate towards the prints, but I like both! I own mostly solids but prefer prints! I love prints and solids- something for every outfit! I’m ALL prints!!! Love them!.